Driving on the twisting roads of Cap d’Antibes feels like living a road movie. Every bend brings a surprise; a glimpse of an infinity pool, a neo-gothic facade, a plunging view, a helicopter taking off. The Cap, which hangs like an anchor in the Mediterranean between Antibes and Cannes, is one of the most exclusive addresses on the Cote d’Azur. Property prices has doubles and even tripled since 2000. Houses start at 1 Million Euros says one agent on the Cap “you can get a small villa of 150m2 on 800m2 of land without a sea view. For 4-5 Million Euros you get a villa twice as big on a 1500m2 plot with a small sea view. If you want the panoramic sea view, you need 10 Million Euros. To the South of the Cap d’Antibes, the walls grow higher, the hedges denser and the price tags higher. The Baie des Milliardaires has just 14 private properties, with villas fetching prices as high as 100 Million Euros. The best-known property is the Chateau de la Croë, where the Duke of Windsor lived for several years after the second world war. The castle, which is surrounded by a 7-ha park sloping down to the sea, was destroyed by a fire in the 1970s and has remained empty for several decades. Its new owner, Roman Abramovich, is restoring it. Today Cap d’Antibes has 2000 properties and its hard to imagine that just 150 years ago it was a barren promontory. It was Gustave Thuret, a Frenchman with a passion for botany, who in 1856 developed the first garden on the Cap. Thuret bought a 7 ha plot of land, imported tones of soil to cover the grounds, and transformed the space into a magnificent park. This development continued into the next decade as wealthy foreigners built splendid winter residences. Cap d’Antibes heyday came in the 1920s, when a rich American couple, Sara and Gerald Murphy, discovered the pleasures of the summer tourism on the Cap. Delighted with the sandy beaches and the beautiful weather, the persuade the Hotel du Cap to rent them a part of the hotel to use for lavish parties. Celebrities such as Rudolph Valentino and Coco Chanel followed in their wake, resulting in the opening of the Hotel du Cap ll summer – the first hotel to do so on the Cote d’Azur. Visiting foreigners included American billionaire Frank Jay Gould, who soon recognized the potential in Juan les Pins, the village at the foot of the Cap, as a summer resort. He joined forces with Edouard Baudoin, a restaurant oner from Nice. Gould built the Hotel le Provencal, a luxury building in art deco style, while Baudoin purchased the casino, which he renovated. Famous musicians and cabaret artists staged events and in no time Juan les Pins became a party town. Villa sprouted up everywhere. One of the most beautiful is the Villa Aujourd’hui, a waterfront property built in 1938 by American architect Barry Dierks. Jack Warner owner it for several years and hosted Hollywood actors and actresses such as Charlie Chaplin and Marilyn Monroe. “Les années folles” – as the 1920s are locally referred to – have left their mark on the Cap today. “The atmosphere of the Cap d’Antibes is relaxed and boheme” says one agent on the Cap. “This makes it very different from the Cap Ferrat. Clients are drawn to the Cap d’Antibes by the easy going atmosphere. They would not want a villa in another place, however beautiful the settings may be”. In hotel Belle Rives, at the Western entrance to the Cap, the 1920s are still palpable. The Belle Rives is entirely art deco and has kept its original furniture. The bar is named after the writer F.Scott Fitzgerald, who spent one summer here living off the royalties of The Great Gatsby. From the Belle Rives beach one can see the former villa of Florence and Frank Jay Gould. “After the death of Frank Gould in 1956, his wife lived in the house” say director Marianne Esthene-Chauvin, the granddaughter of the founder of the Belle-Rives. “One of my guests still remembers Mrs Gould drinking tea on her terrace at 4pm”. Todays Gould masterpiece is no more than a skeleton. But its glory days are to return, with the building set to be refurbished into luxury apartments with a completion date in 2009. The properties will benefit from a view of the bay of Golfe Juan and the Iles de Lerins and will be priced at 20 000 Euros per square meter. Such values are assisted by the fact that apartment blocks on Cap d’Antibes are scarce and sea front apartments seldom come on to the market. One of the best locations now is the Residence du Port Gallice, on the west side of the Cap facing the harbor. Yacht owners only have to cross the street from their home. Price vary between 10 000 Euros and 12 000 euros per meter square. Plots of land on the Cap are even more rare. 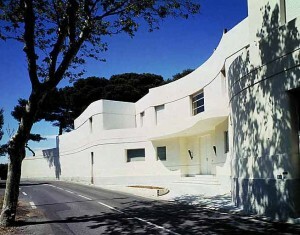 New buildings on the Cap are subject to restrictions imposed by the municipality of Antibes and Batiment de France. planning applications must pass several stages and particular conditions might be imposed. Not respecting building regulations can have serious consequences. One agent cites the case of a Russian who bought a Belle Epoque villa. The biggest and most blatant case of the contravention of planning laws is that of the Villa l’Islette in the baie des Milliardaires, also called Villa Pellerin after its owner at the time. The house was illegally extended with a 1600 m2 basement. Although hidden behind artificial rocks the extension was discovered in 1990 and led to the entire house being demolished in 2002. Today the main buyers on the Cap d’Antibes are English Russian and Irish. There is a new wave of Irish buyers since two or three years ago, claims one agent. The Russians started 10 years ago. The English on the other hand, have always been present on the Cap. While they like to renovated and sell, the Russians tend to keep their properties. By consequence the market has been narrowing considerably over the past 10 years. Each year, out of 2000 properties, about 50 come off the market. The more expensive the property, the quicker it sells. Take properties with direct access to the sea, there are 20 in total. It is easier to rent one of these prestigious properties. Many owners like to let their property if only to cover the cost of maintenance.